farm | Ag Moos "Growing the Land"
In Lancaster County, Pennsylvania, we just don’t get emergency texts on our cell phones saying “Tornado warning in this area. Take shelter now.” But in February, we did. An EF 2 tornado traveled 6 miles in eastern Lancaster County. No one was injured, and the community pulled together and set to the task of rebuilding just 8 miles from my home. SALISBURY TOWNSHIP, Pa. — With little more than a 10-minute warning for those with cell phones, the tornado had struck eastern Lancaster County after dark last Wednesday (Feb. 24). Of all the folks interviewed in the days after, no one saw it. But many felt its fury. Corrie Eby was just trying to put her two-year-old daughter to bed. Her husband James was in Paradise at a church event with their two older daughters. Her mother-in-law called from the house next door and said she had just heard the warning. Corrie called her husband as she and her daughter headed for the basement. They spoke briefly and then lost contact. The house had been spared except for some damage to the slate roof. She called her husband. “I told him something has happened. This is not normal,” Corrie recalled a week later. Indeed, it wasn’t. She saw the row of pines, separating their home from James’ parents’ home, was gone. She heard the generator going in the chicken houses on the hill so she didn’t give that a thought. She saw a stone’s throw from the house that the garage, shed and huge portions of the 200-year-old bank barn were gone, gates were flung everywhere and the door of the barn was crumpled-in like tin foil. “The cows were all safe and sound, so I rigged some gates for them,” she said. James was on his way home and received a call from the White Horse Fire Co. that his chicken houses were gone, destroyed. 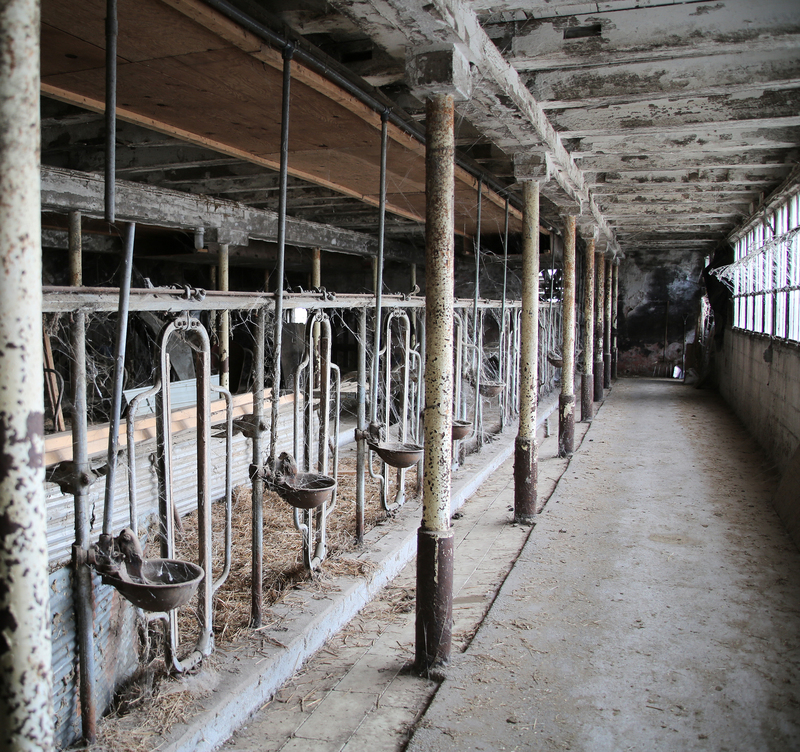 They were the home for the couple’s 35,000 organic cage-free layer hens — their sole source of income, apart from the small beef cow/calf herd of which all 25 cows survived. At first light, emergency management folks and the team from Heritage evaluated the surviving and injured poultry and set about the trying task of humanely euthanizing them. “People just kept showing up that morning by the van loads. We had 300 people here, an incredible outpouring from friends and family, and people we never met before,” he said. A roller-coaster of emotion followed. Going into the weekend, the couple was invigorated. But on Monday morning, reality struck. Their layer hens were gone, and their income along with them. A new flock at the hatchery was already tagged for them for June delivery in the normal turnover of layer flocks, so they realize they now have a narrow window to rebuild the two houses and see the difficulty of getting the building scheduled into that window. If they miss the June rebuilding date, it could be months before another flock could be scheduled for them. One of the two chicken barns lost was built in the 1980s when James’ father Dennis operated the farm, and the other barn would have been one year old in April. Both are completely gone, except for the egg-packing house at the far end. And then there is the bank barn. The stone end wall and part of the rock side wall, mortared with horse-hair plaster from over 200 years ago, still stands, but it took a major hit with much of the surrounding wood structure gone or damaged. The farm has been in the Eby family five generations. The barn houses their small herd of cattle and their hay. It has stood the test of time and is the spot where James and Corrie celebrated their marriage. On day five after the storm, a builder, stone experts and an architect were on hand working to secure the stone wall before arrangements could be made to set new rafters and restore it. “A lot of people have backed us this week. We never felt alone in this,” the Ebys agreed. He and his crew had worked on another damage site before coming to the Eby farm on day four to work on outbuildings and the stone bank barn. Like other contractors, he had been out all week and into a second week doing this work in the tornado-stricken community. Stoltzfus tells of the professional network of suppliers also opening up their schedules. For example, “Rigidply Rafters got trusses to us in less than 24 hours, and the concrete and stone companies offered special pricing and kept drivers on staff to help,” he said. “AJ Bolenski suppled us with dumpsters, not free, but this took extra staffing. And Lowes gave us a 10% discount and prioritized delivery. “The real heroes are the ones doing all the work and those behind the scenes, including the ladies at the fire hall with the food, the office staff and my wife Kate,” Stoltzfus added. Stoltzfus and others on-site at the Eby farm Tuesday, said it was the hardest hit from an economic standpoint. When work begins on the chicken houses — once the Ebys secure a poultry house builder who can schedule it — skilled volunteer crews from the community and beyond will be coordinated to move the process along and make the deadline for the June flock. They hope to avoid going more than three months without income. A friend of the family has up an Eby Tornado Restoration Fund at https://www.gofundme.com/rrr93ns8. Over $8000 has been raised toward the goal within the first 10 days. The EF 2 tornado touched down just 10 minutes later, along a 6-mile stretch on both sides of Rte. 340 by the Pequea Creek, producing winds over 100 mph and doing an estimated $8 million in damage to barns, sheds, homes, and schools of this largely Amish community of farmers and craftsmen, including the loss of two-chicken houses and 35,000 hens at the non-Amish of James and Corrie Eby. Miraculously, not a single person was injured — even more so, considering that in a barn just across the road from the one-room schoolhouse that had been completely blown away, 150 youth were holding a benefit auction. There was no time for them to do anything but wait it out. They described feeling as though the wind lifted the roof six inches from the rafters above them without removing it. The 100-foot wide tornado veered just northeast of the barn to level the empty schoolhouse and proceed through a windbreak of trees, missing a house on the hill and diminishing in its fury just shy of the Wanner farm in Narvon. Much of the damage along the tornado’s path lay immediately west of the fire hall. Traveling the area on day four after the storm, it was unbelievable what had been accomplished with a little organization from the fire hall and the community’s storm recovery committee, combined with the downright amazing outpouring of volunteer crews within the extended community, as well as skilled crews coming in from more than 100 miles away. On the night of the storm, White Horse Fire Co. was busy responding to calls, checking for injuries, helping those whose homes were impacted find refuge, and securing the safety of the situation. By 7:30 the next morning, over 150 people and 10 to 12 contractors showed up with their trucks, tools and skills at the fire hall, instead of going to their jobs. The efforts gradually bridged over to the community via the White Horse Storm Recovery Committee. By days two and three, there were over 500 volunteers on one major-damage site and 300 on another. And there was plenty of food all week, donated by the area’s restaurants and grocers too numerous to name. “Each day, every morning, people just walked in to the fire hall to help,” King recounted. They brought vehicles, equipment, backhoes, track hoes, and contractors secured a steady flow of dumpsters. Skilled craftsmen made outbuildings at their shops and brought them to the locations sustaining losses. Taxi drivers and shuttle vans showed up donating a day of service picking up volunteers and moving them between damage sites. There were seven primary damage sites and a total of approximately 35 properties sustaining a range of minor to severe damage. A firefighter was assigned to each of the seven primary sites to maintain radio communications because the first priority was to secure the safety of workers as they cleared debris and evaluated and stabilized buildings. Of the dairy farms affected, it is reported that cows were able to be milked pretty much on schedule. While the tornado lifted and scattered the second story on several bank barns, the tie-stalls below were largely spared. As for the rest of the largely Amish community, most were unaware of the broadcasts on local television until the national news media began to show up. They were amazed by how the outside world would be so generous to come help. People were calling the fire hall and visiting the White Horse Fire Co. website looking for ways to donate money, services, food. The fire company created a link on their website where visitors could link up with the Mennonite Disaster Service, based in Lititz, Pa.
A committee was formed for the White Horse Tornado Relief Fund so that donations there go to the folks who are facing true hardship. Once those needs are satisfied, any potential remaining funds will go to victims of other storms elsewhere through the Mennonite Disaster Service. For those wanting to donate to the Tornado Relief Fund for Salisbury Township and the village of White Horse, donations are being received by the Mennonite Disaster Service, 583 Airport Road, Lititz, Pa. 17543. Checks should be made payable to Mennonite Disaster Service while noting “Lancaster County Tornado” in the memo line. Skilled crews who want to be involved in current and future restoration from the impact of the tornado in Lancaster County, can contact the White Horse storm recovery committee via the fire company at whitehorsefire.org. There are no ‘snow days’ on the farm. 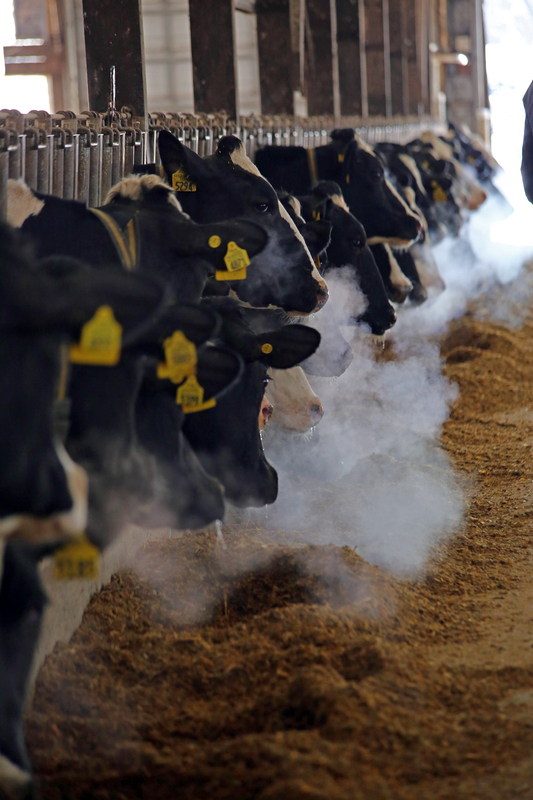 “When it is this cold, the simple every day protocols become enduring days of work,” notes Cody Williams of Wil-Roc Dairy, Kinderhook, where 1500 Holstein dairy cows are milked and cared for. Frozen pipes, pumps, waterers, and manure — as well as difficulty in starting equipment — are commonly reported concerns. When the snow piles up and the temperatures plummet, concerns turn to keeping rooftops clear of a too-heavy burden and being vigilant about the increased risk of fires. In closed group discussions throughout social media, farmers exchange ideas and seek support from each other. When the Polar Vortex gripped the northern half of the country in 2014, farmers were up to the challenge. 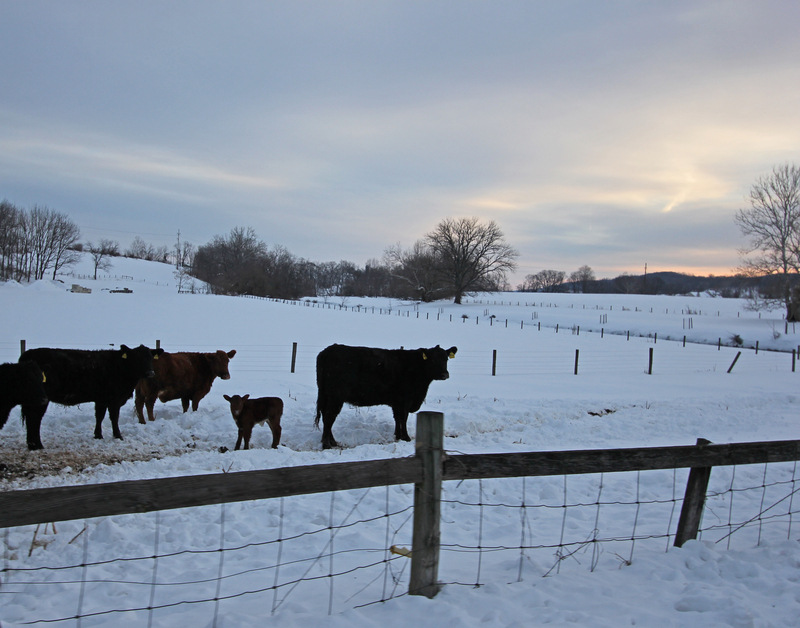 Last week the mercury hit -14 at Trowbridge Angus Farm, where it is calving season January through March. The family, and their over 300 beef breeding cows, were navigating two to three feet of snow cover. Twenty miles away near Schodack Landing, temps of -11 went virtually unnoticed by the over 700 Jersey dairy cows at Dutch Hollow Farm. They are tucked away in their barns with retractable sidewall curtains that stay open more often than not for natural light and ventilation but remain closed when the wind chills get this low. Cattle are cold weather animals, but they do not like wind or drafts. The difference between beef and dairy breeds is the way their centuries-old partnership with man has adapted through specialized breeding and care. 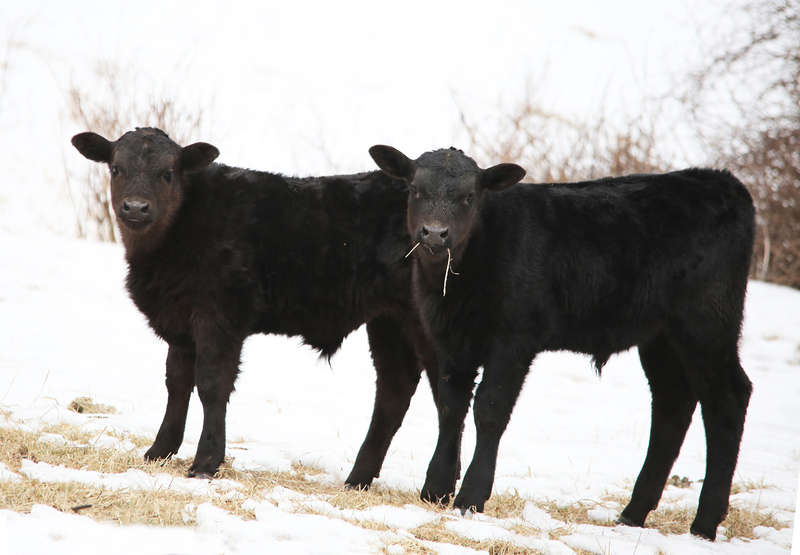 Beef breed cattle are kept outside pretty much year-round, coming into the barn only at calving time. 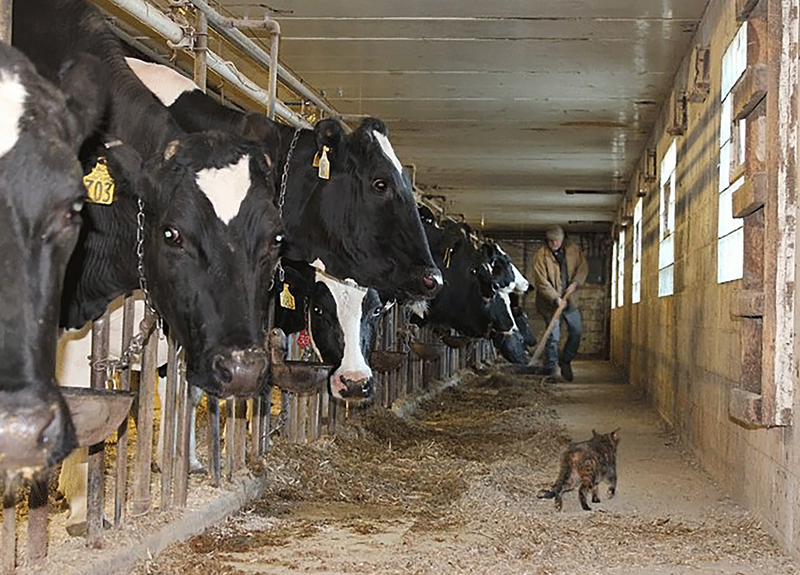 Dairy cattle, on the other hand, are typically housed in barns year-round. While beef breed cattle spend more time foraging for their food and seeking the natural and provided windbreaks to lay down, dairy cattle in freestall barns will amble short distances inside from feedbunks and waterers to the deep-bedded stalls that are groomed for them two or three times a day while they are milking. Dairy cows are accustomed to constant human handling from the time they are calves. They have a different temperament about the whole calving deal.They aren’t worried about predators and trust the humans they work beside day in and day out to care for them and their offspring. Beef breeding cows, on the other hand, are more self-sufficient and protective of their young. They raise their offspring for the more hands-off life as a non-milking breeding animal or to spend 80% of their life foraging on pasture with the last 20% of their life in the beef fattening phase. One thing in common: Both beef and dairy producers focus on the newborns immediately at birth to make sure each calf gets a warm start and enough colostrum for the passive transfer of immunity from its dam. Stockpiled pasture grasses make a nice winter forage as cattle can push off a few inches or a foot of snow to graze it, and they do well getting around in the snow outdoors. But with over two feet of snow cover this winter, the Trowbridge family cuts trails to help the cattle conserve energy. 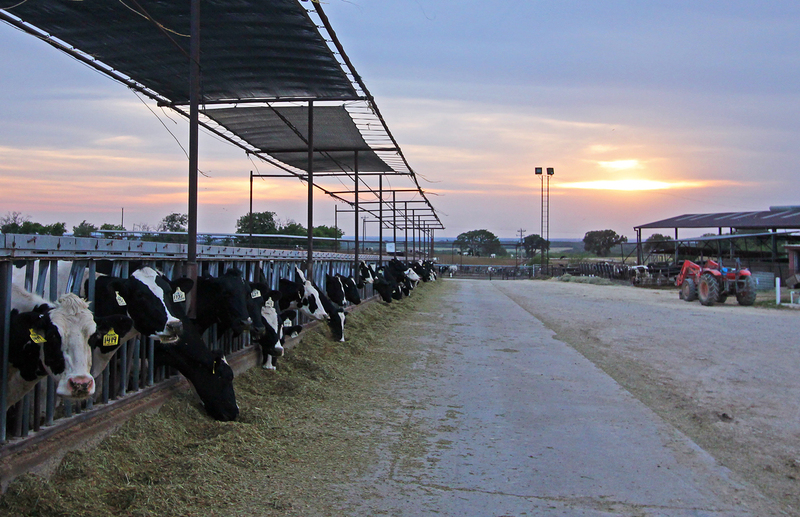 They also put down extra bedding, more often, in the areas with windbreaks and feed more outdoor hay and supplement. Meanwhile, on a dairy farm, the cows calve year-round. Calving pens are watched through video monitoring or by walk-throughs. The immediate newborn calf care continues through the first few weeks of life in the calf nursery or individual hutches. Newborns often get time in a heat box or wear calf jackets and sometimes earmuffs when it’s this cold, and they are fed more often for increased energy to maintain their temperature and to grow. Water is critical for drinking and cleaning, so lines are buried underground and drinking tubs are equipped with heaters. 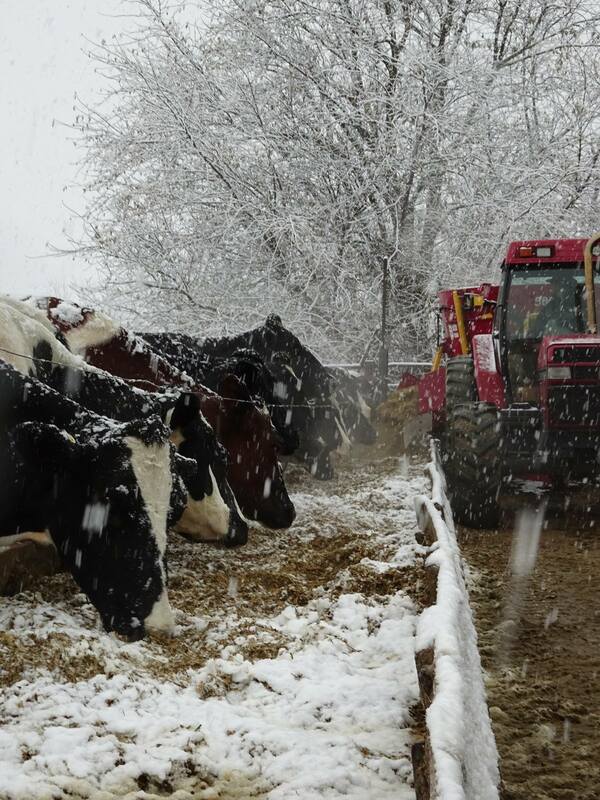 Dairy and beef cattle are adapted differently, but they all depend on their people for great care during the weather extremes we have seen here this winter. Farming is not for the faint of heart. Everyday tasks take longer to complete but it sure is rewarding to see cows thrive and calves frolic after a good start – regardless of the weather! Photos by Sherry Bunting, Tricia Adams and Evelyn Troutman. 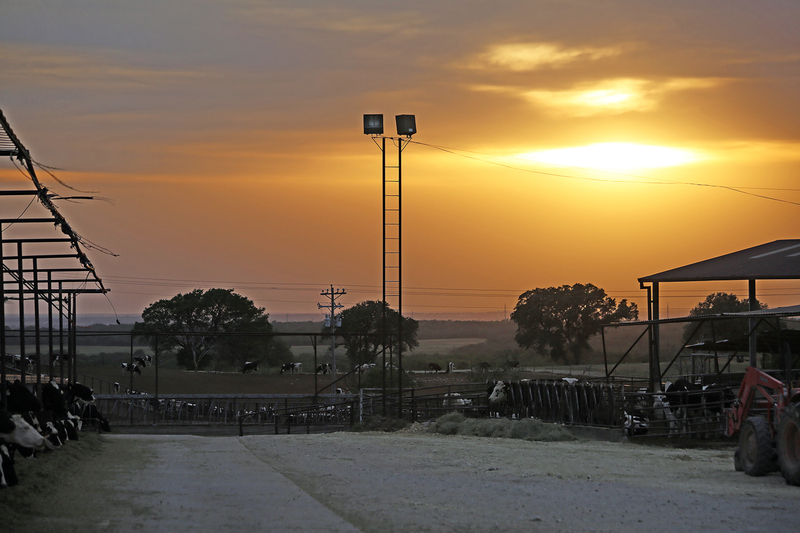 work on other dairies in California to pave the way to be living their dream today in Central Texas. 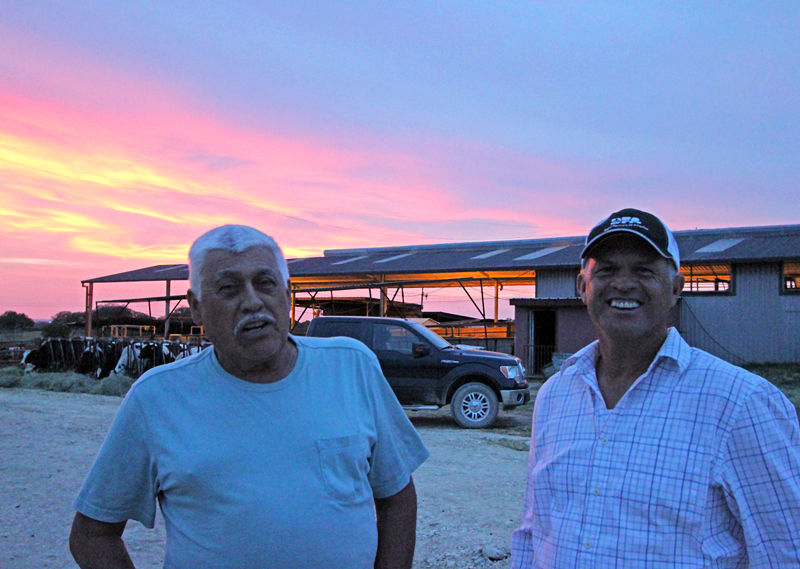 Hard work, disciplined saving, and hands-on management are the three keys Hector Jimenez and his uncle Arturo Rodriguez say brought them through 20-plus years of working for others and 10 years dairying on their own – including the 2009-13 era of tight to negative margins. “We worked together since 1979 and always talked about one day having our own dairy,” Hector recalls. 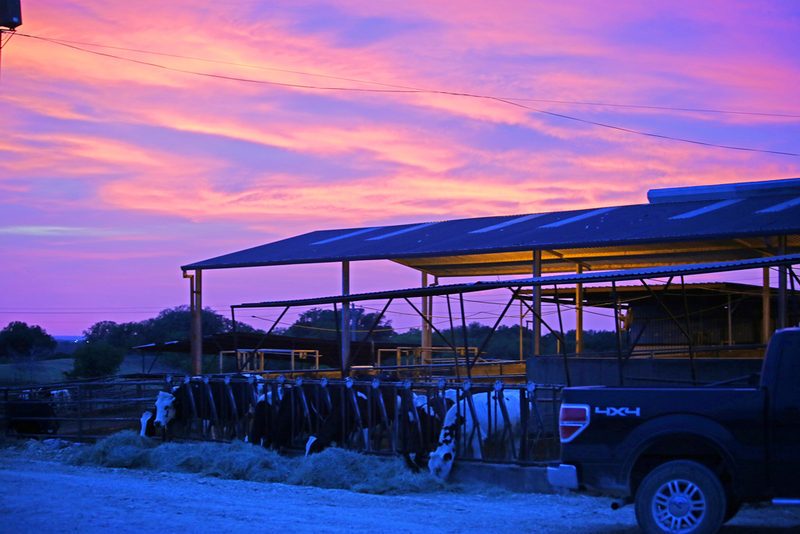 That day came in 2004 when Hector and Arturo bought a dairy near Dublin that had been vacant for a number of years after its previous owner moved west to where the dairy industry was expanding in the Panhandle. They moved here from California with nothing, bought 110 cows and milked three months on a rented dairy, then partnered in their own R&J Dairy. They bought another 150 cows and took their time raising their own replacements to expand steadily through internal herd growth. “W e started with No. 1 and this calf, here, is No. 2869,” Hector smiles, pointing out a newborn heifer. Today their herd of 850 milking cows is 95% homebred. They produce an average of 75 pounds/cow/day and have achieve somatic cell counts at or below 200,000. 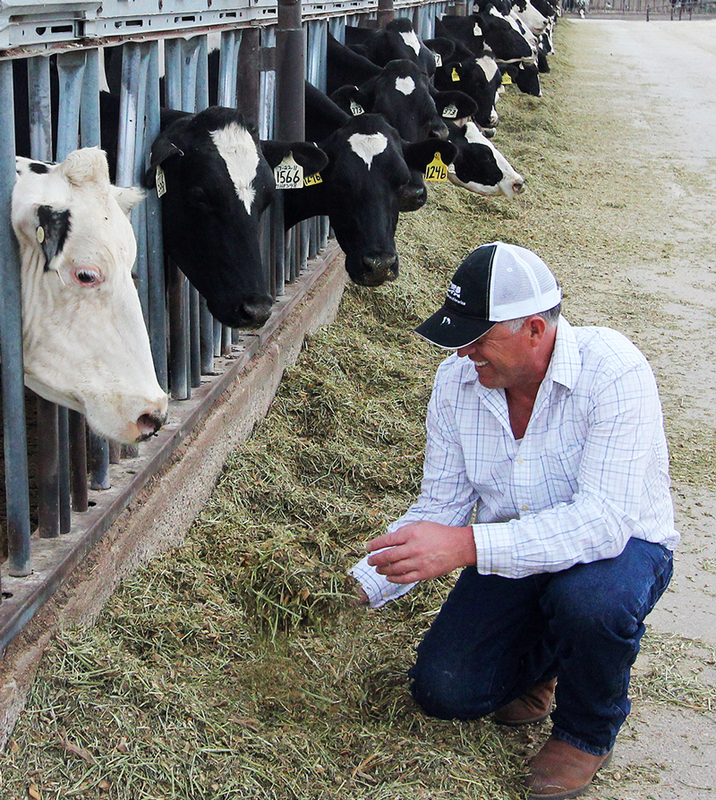 They are satisfied with the current size of their dairy as they build back their numbers after a few years of heavier culling rates while milk margins and feed costs were tight to negative. The recent memory of 2009-13 brings daily reminders of the importance of saving, working, and being cautious. “We culled heavily because we needed that money to pay bills,” Hector relates. Today, the herd is 30% first-calf 2-year-olds. “And worked hard,” added Hector. He and Arturo are hands-on managers. 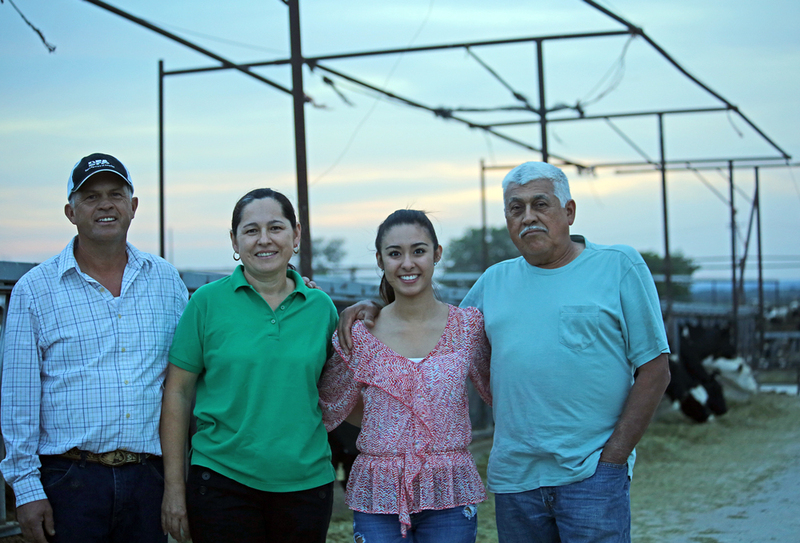 “My uncle is out here feeding cows at 4 a.m. and I start at 5 a.m.,” says Hector, who does all of the breeding. His day starts with cleaning the milk tank and the parlor, checking fresh cows, and starting the day’s breeding lineup. “My husband is in love with what he does. He never complains. He and Arturo are always here – rain or shine, good or bad — that’s how we made it this far,” Fabiola adds. She and Arturo’s wife Sylvia — and more recently Arturo’s daughter Christian — take care of all the calves at R&J Dairy. They employ 10 people, mainly milkers. They feel a sense of satisfaction in coming to the U.S. from Mexico in the mid-to-late 1970s, working hard, starting a new life here, including their own dairy business, raising children who are either interested in the dairy or working good jobs in the community, and now providing jobs for others in the community. Halfway through their first decade in business together, Hector and Arturo hit the 2009 milk market train wreck followed by years of drought and surging feed prices. Cutting expenses was a big part of that picture from 2009-12, and the partners aren’t so fast to spend money now that dairy margins are good. They have 220 acres and rent some additional property for growing coastal hay. That, and working with their nutritionist in feeding commodities like corn gluten, canola and cottonseed along with purchased corn silage — helps them manage feed costs. They feed a dry cow ration and move the close-up cows and first calve rs close to the house for observation. They also use Udder Comfort after each milking for a few days post-calving to reduce edema and improve recovery time. The breeding program involves synchronization, but only for those cattle that are not showing heats. Hector and Arturo pick the bulls. “We look for high components – fat and protein – as well as calving ease,” Hector explains. High components and high milk quality are two keys to making the most of their milk check in both high and low market times. Those two-plus decades of hard work for other dairies have rewarded Hector and Arturo with more of the work they love, but now they do the work for their own dairy investment. 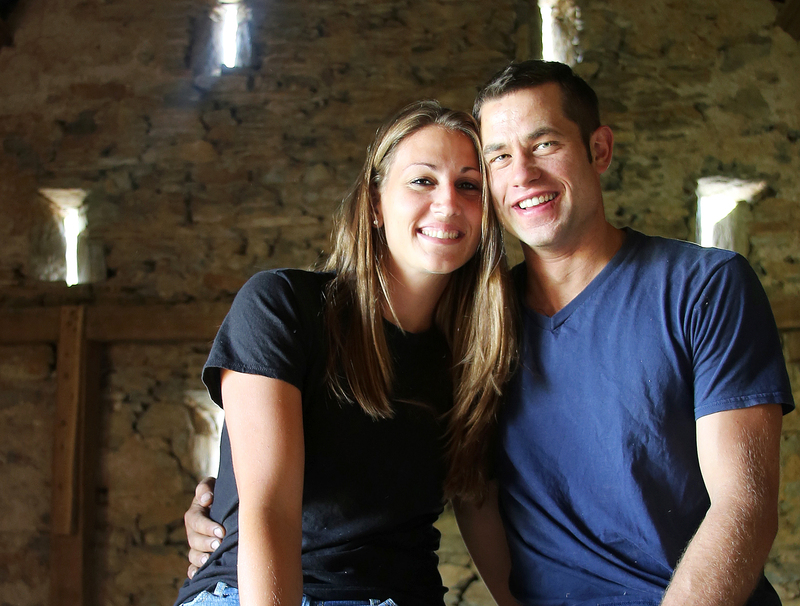 As these two partners have experienced over the past 10 years dairying on their own – “Even when you have your own business, the work doesn’t stop and in some ways you work even harder. You have to be here, work here, live here,” Arturo explains. He explains that they were fortunate to have built up some equity they could borrow on, and he estimates that another three months of milk prices as high as April’s may finally pay back what they lost in 2009. “We try to stay ready for the next downturn,” the two men agree. As for forward contracting, Hector and Arturo prefer to take on the risk. They believe that while the new insurance program will help and some folks have benefitted with forward contracting… nothing substitutes for hard work, saving during the good times, and close management and caution all the time. WOMELSDORF, Pa. — Some stories just have to be told, and this is one of them. For Jeremy Meck and Kacie Hershey, engaged to be married November 7th, 2014, their chance meeting happened at a time of loss and uncertainty in the midst of one of the harshest winters southeast Pennsylvania has ever endured. For Jeremy, it was a season of profound loss. Not only had he lost his brother to cancer in February, in Zach he had lost his best friend and business partner. Meck Brothers Dairy here in Berks County was the dream they had built up from scratch — a dream they had worked on together ever since grade school in Lancaster County when their late father Ronald, a poultry farmer, bought them a heifer calf for 4-H, igniting a passion for cattle that morphed from raising calves to milking cows, to buying and renovating their own dairy farm. “It was a rough winter at the farm, with one thing after another, and it was hard to stay focused as Zach became more ill,” Jeremy related during a summer visit to the farm. What he described was like a dark fog that threatened to settle-in around him. “I was praying for God’s guidance, for direction, for clarity… and I found myself praying for joy,” he recalls. Goosebumps come with the next words from Kacie, as she confirmed her middle name is, you guessed it: Joy. “God had a big part in us meeting,” she said about the chance meeting that was not so much by chance after all. Kacie was facing her own need for clarity. She graduated with a teaching degree and was substituting here and there while working for her parents, Duane and Marilyn Hershey, at their Ar-Joy Farms near Cochranville, Chester County. With Marilyn on the DMI board and Duane on the Land O’Lakes board, Kacie’s parents travel a lot. “I started picking up more responsibility at the farm and I needed to make some decisions,” she recalls. Seeking a teaching job, and feeling conflicted about the future, she, too, was praying for direction. What Kacie didn’t know was that her grandmother Anna Stoltzfus had started that week praying for God to bring someone into her granddaughter’s life. Meanwhile, Kacie’s father, Duane, was one of several dairy farmers who kept intermittent contact with Jeremy during Zach’s illness and after his passing. Farmers in the community of Berks and Lebanon counties were especially helpful, reaching out in so many ways to mentor the brothers and to pitch in with fieldwork, and fundraisers, when the need arose. From two neighboring counties in the same Land O’Lakes region, Duane and Zach had run against each other for the Land O’Lakes board seat a year earlier. The 3-way race had come down to a tie, and the differences could not have been more stark: Duane, a seasoned third generation dairyman whose father served as a representative in the Pennsylvania General Assembly versus Zach, the young, energetic, first-generation upstart dairyman always running full-tilt, wanting his generation to have a say. The special tie-breaker election had occurred the previous January, with Duane winning the seat. The two continued their chiding camaraderie after the election, and Duane checked in from time to time to see how things were going on the farm after Zach’s cancer diagnosis the following September. Newlywed to Suzanne Perdue, Zach’s illness came at a time when he was just settling into the future he thought lay before him. Being connected to a loss like this will test the strongest faith. Looking back on it, Jeremy says he learned a lot about commitment watching how Suzanne traveled that journey with Zach. But mostly, he recalls the example of how Suzanne was there for Zach every step of the way. With Zach gone, it was difficult for Jeremy to make that dream — their dream — his own. The winter wore-on the way it does daily on a dairy farm. Sub-zero temperatures brought daily challenges from power outages and frozen pipes to difficulty starting equipment and the sheer effort of getting through the growing mountain of snow to tend cattle and feed calves and make a path for the milk truck to get up the hill. 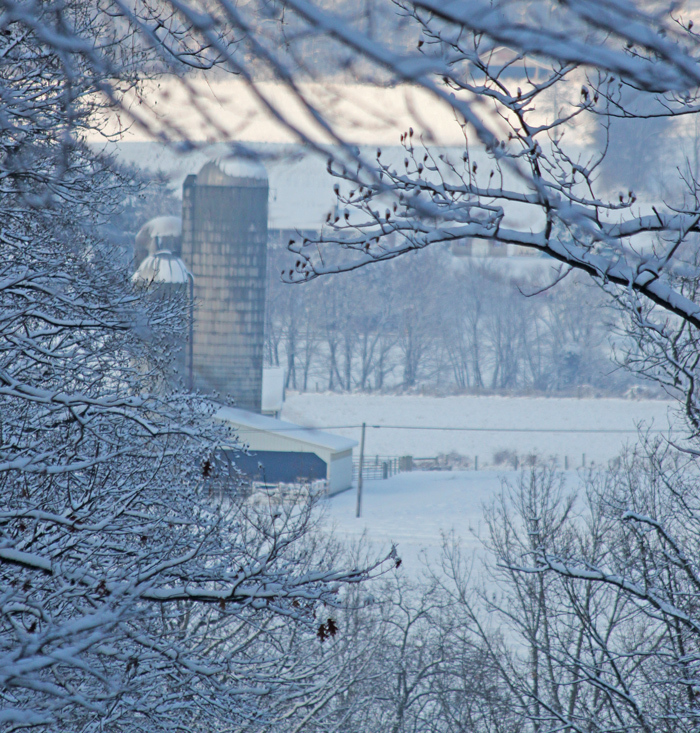 Then the unexpected: The day-after-day snows and frigid temperatures took their toll at the Hershey family’s Ar-Joy Farms with the midnight collapse of the roof on their main barn housing over 500 milk cows. Thankfully, the milking employees were all at the parlor, not in the barn. Cattle were lost, but the majority of the herd survived. The next 72 hours brought a whirlwind of moving cattle, cleaning up, and a community effort to come in with the builder to put up a new roof. A work day was organized by fellow farmers in that community and the word of it spread. “I had so much happening here, I wasn’t going out or going anywhere,” Jeremy recalls. It was just two weeks after losing Zach when he heard from a neighbor about the Hersheys’ roof collapse. Duane had called to check in a few days before and so Jeremy returned the favor. He called to see if they needed help or equipment, but he never reached Duane by phone, so he headed to Cochranville figuring to lend a hand in the cleanup. Had he reached Duane by phone, Duane would have emphatically told him to stay put, knowing Jeremy had enough on his plate at his own farm. But with no word from the wise to deter him Jeremy showed up and spent the day working on someone else’s problem instead of dwelling on his own. Jeremy and Kacie met as she brought water to her Dad and the crew. Kacie recalls thinking to herself: “Who is this guy, and why have I never seen him before?” Followed, of course, by making sure to procure another round of water for that crew. Both were intrigued and struck up a friendship, after first looking each other up on Facebook (of course) and realizing they had friends in common. Jeremy’s best man is herd vet Nathan Kapp of Gap Vets, whose wife works with a friend of Kacie’s at Pioneer. A first date led to a second, and things took off from there. “When I told my Dad we were dating, I just got this big smile and some comment about tractors,” Kacie laughs. Spring came, and Kacie continued working at the home farm, then driving to Jeremy’s to help with whatever needed doing — from the cattle to the corn planting. “What I fell in love with first is Jeremy’s faith,” Kacie recalls. Windows of light open doors, through faith. Both Jeremy and Kacie were individually going through difficulties and seeking direction for their lives. They both had questions about their own futures, and God’s answer was an unexpected ‘chance’ meeting. “We would not have met any other way,” they agree. “For our country, for us all,” read the Marines billboard as I drove through the nation’s heartland. I turned the phrase over in my mind, thinking just what kind of courage, heart, and love of country it takes to serve i n our nation’s military. A rush of thankfulness flooded over me as the tires of my Jeep Patriot ate the miles to the next destination, and farmland stretched endlessly on either side of the highway. Today, our nation commemorates Memorial Day, which began as Decoration Day, when the grave decorating custom became more prevalent during and after the Civil War, honoring soldiers who died — both Union and Confederate. Since then, the final Monday in May has become a special time to honor all of the men and women who have served and died, paying the ultimate price for our freedom and our country. As I travel for various ag projects, I am struck by the diverse beauty of both the land and the people in our United States of America. In the long rural stretches of open land from the Midwest through the Great Plains — where you can drive for an hour and not see another vehicle, where the farm report comes on the radio several times a day and consumes the hours of 5 a.m. to 8 a.m. on the local cable channel as I write this — you get a feel for the bigness of America, and its call of freedom. In the East — where the patchwork of small farms live at the fringes of suburbia with subdivisions sometimes sprinkled between them — agriculture, both land and livestock come in all varieties, a framing and founding fabric for our American tapestry. 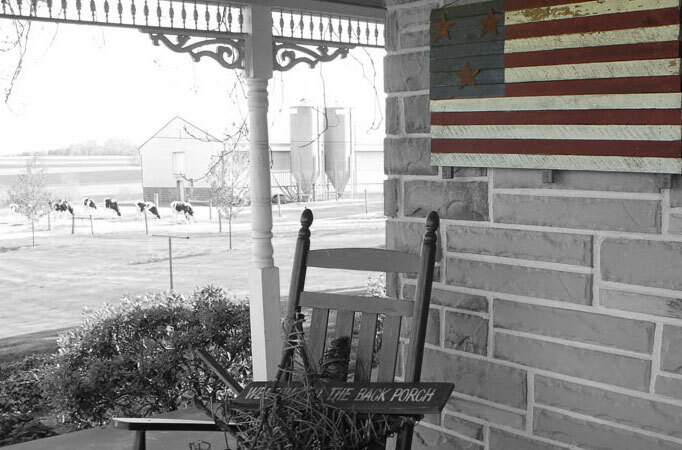 American soldiers come from all walks of life and all regions of the country, but one thing we often overlook is the high percentage coming from farms and ranches and rural living. As I drove past that billboard — on a highway near Lubbock, Texas — I also whispered a ‘thank you’ for the fathers and the mothers, and the families and the communities, who have raised, and then lost, these men and women who have paid the ultimate price so that we may all be free.